Repairing or maintaining the automotive or other things around the house may not be everyone’s cup of tea. 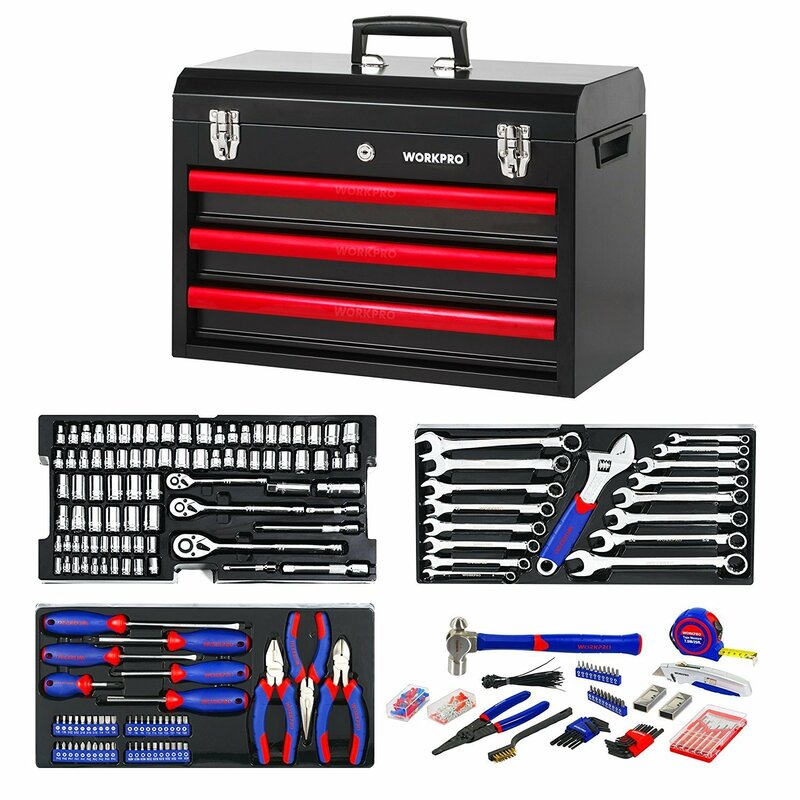 However, when you don’t want to incur the extra expense of seeking professional assistance or have a knack for it, a dependable and practical mechanics tool set is a must-have. Most have the necessary tools required for ratcheting, hammering or screwing fasteners back in place. For best results, you need a set that’s practical, versatile, comfortable to use, and very functional to make quick, easy, and effective work of the project. To help you with that decision, we’ve put together a list of ten of the best mechanics tool sets on the market currently. 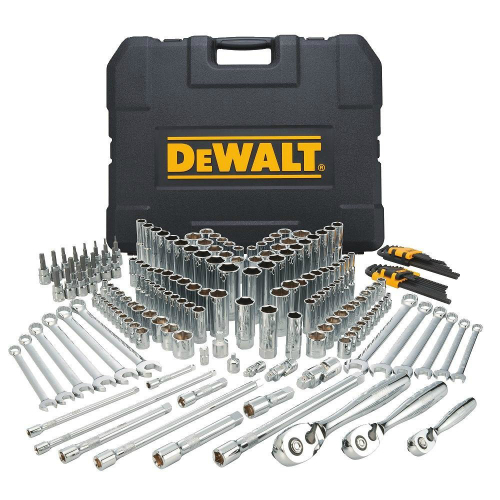 The Dewalt DWMT72165 204 piece set is a comprehensive and careful collection of 204 different pieces, mostly sockets, ratchets, and wrenches that will come in handy for a wide range of automotive diagnosis and repair. The set is a popular choice for both professional and greenhorn mechanics as well as DIY enthusiasts and everyone else in between. And for good reasons. Aside from the professional construction and durability of the set, the pieces are also SAW and metric and provide incredible amounts of torque and leverage, thanks to the brand’s proprietary technology. 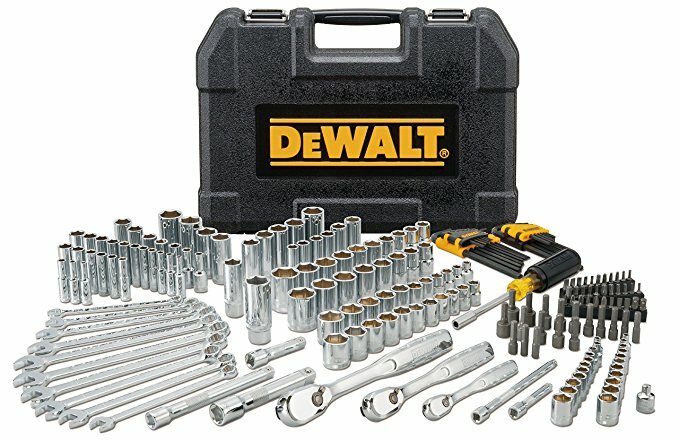 DeWalt has a reputation for making the industry's leading products that are highly functional, long-lasting, and affordable, and the mechanics tool set easily and gracefully continues that tradition. For one, the construction of all the 204 pieces from industrial-grade and high-quality chrome steel means they'll easily last more than a lifetime of heavy, everyday use. They are similarly resistant to corrosion, an important quality when you have to undertake several projects in multiple settings. On the flipside, though, polished chrome steel is remarkably heavier than most other materials. Its definitive performance easily and clearly sets it apart from other mechanics tool sets on the market. It works in a remarkably effortless and quick fashion, completely taking the time and effort from an otherwise onerous task. Each piece has 72 teeth, allowing for as little as 5-degree turn in tight spots while simultaneously giving the user extra leverage and control. The efficiency the set provides means you will be loosening or tightening fasteners quickly and with little effort. The set comes with both deep and shallow sockets, enabling you to effectively tackle a number of projects without experiencing any hiccups. Identifying the pieces will also be easy, thanks to the hard stamped markings on the sockets and wrenches while the knurled ring gives the user more control and ensures firm and secure grip. And you get a convenient long-lasting blow mold case for storing and protecting all the pieces. Undeniably, the Dewalt DWMT72165 is one of the best mechanics tool sets out on the market currently. It’s carefully assorted, high-quality, packed to the brim with useful features, and cost-effective. 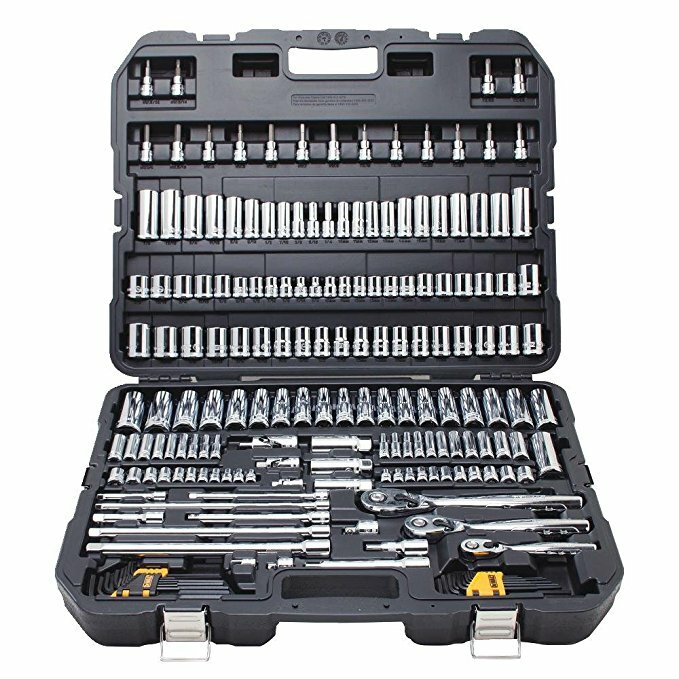 Like our previous pick, the Craftsman 165 pc set is Craftsman's flagship mechanics tool set that packs all the features and specs to make easy and quick work of all work mechanics, professional or amateur, can undertake. Being one of the industry's doyen, the tool set is without a doubt a high-quality choice, made with the comfort and safety of the user in mind. It's a versatile and flexible choice that's perfect for use at home or at work. And because of its careful assortment of the commonly used tools, it's an all-around set that will adequately meet all your basic needs. Whatever the setting, the mechanics tool set will invariably meet all your mechanical needs. Among other things, you can use it to quickly and efficiently assemble a new grill, furniture, a bicycle. All without having to seek the assistance of a professional mechanic or borrowing your neighbour's tool set. Such versatility is only possible because of the machine's careful assortment of various tools. The set provides you with + 90 sockets. Also, you get one ratchet in each drive size, 2 bars for extension, and 2 universal joints. There are also 12 wrenches (combination) in addition to screwdriver bits, nut driver bits, hex keys, driver handle. The bottom line is that the machine conveniently provides you with all the tools you need for quick and easy mechanical work. Aside from versatility and smooth performance, the mechanics tool set also throws ease of use in the mix to make your life incredibly simple. The pieces are ergonomically designed for comfort and convenience. They are made from high-quality materials to last a lifetime and they come in a handy heavy-duty, high-quality carrying case to keep everything all neat and safe. And the set comes with a generous lifetime warranty. For greenhorns and seasoned mechanics out there in search of a commercial-grade set, look no further than this option. It's durable, versatile, affordable, and has all the pieces you need in a lightweight and highly portable carrying case. If you’re anything like us, the most essential features you look for in a set are quality, reliability, and versatility. One of a handful of the sets on the market that has these features in abundance is the Stanley STMT71654 201-Piece set. The set is the epitome of efficiency and convenience, heralding breakthroughs in an industry where innovation is the only way of setting oneself apart in the face of cut-throat competition. The industrial-grade construction of the material also means it’ll last more than a lifetime, providing the user with efficiency even when it starts approaching the tail end of its useful life. This option is a workhorse, made from industrial-grade materials to enable the user to undertake a plethora of mechanical projects around the house, in the garage, and on the busiest work sites. 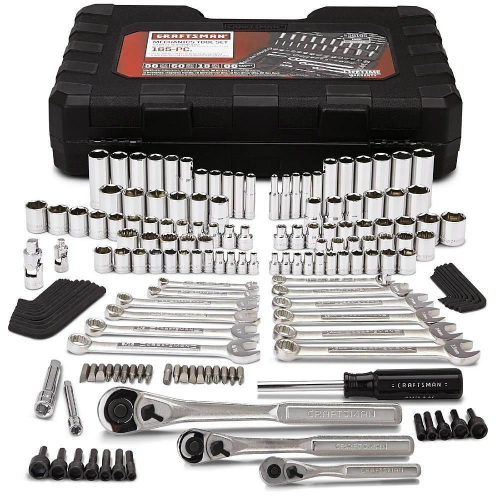 It brings within close and quick reach the most commonly used tools such as 3 round head, quick-release ratchets in sizes 1/4, 3/8, and 1/2-inch, 8 combination wrenches, and 68 6-point regular and deep sockets. To these add the equally useful 3 extension bars that give the user easy and stress-free access to hard-to-reach spots. As alluded earlier, using it is a cinch. In addition to their ergonomic design, the handles come with easy-to-use, thumb-operated, reverse mechanism. The heavy-duty carrying case, on the other hand, makes storing and storing all the pieces easy and convenient. The case is both rugged and long-lasting so it provides you with several years of service. The pieces have a polish chrome finish to resist corrosion and a quick-release feature for the quick and easy removal of extensions and sockets. And like our previous pick, the model is built to last several years on end. The use of chrome vanadium forged steel for construction means it’s strong and durable, enabling to meet and even surpass ANSI specifications. The set provides for easy and quick switching and sufficient leverage so you don’t put too much effort into tightening or loosening. 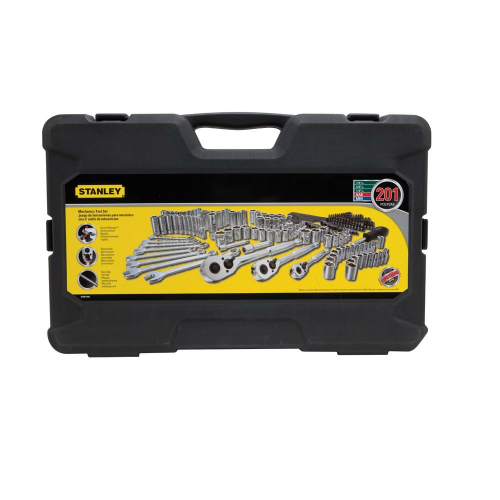 For everyday use around the house, the Craftsman 230-piece set more than suffices. Like all other high-end options, the product has all the commonly used pieces to make for a smooth and quick completion of various projects around the house, in the garage, and in other settings. The simplicity and reliability it provides make it an all-time favorite of the vast majority of homeowners in search of a cost-effective and practical set. Craftsman, and its products, has stacked up well against other equally competent brands on the market for years. Like this set so easily proves, the brand has a knack for harnessing its decades of experience and expertise in the industry to provide the user with one of the best fastener tightening and loosening experiences. The package, consisting mostly of sockets, has everything you need to confidently embark on a wide range of projects. The set has a whopping 116 sockets in both metric and SAE sizes. 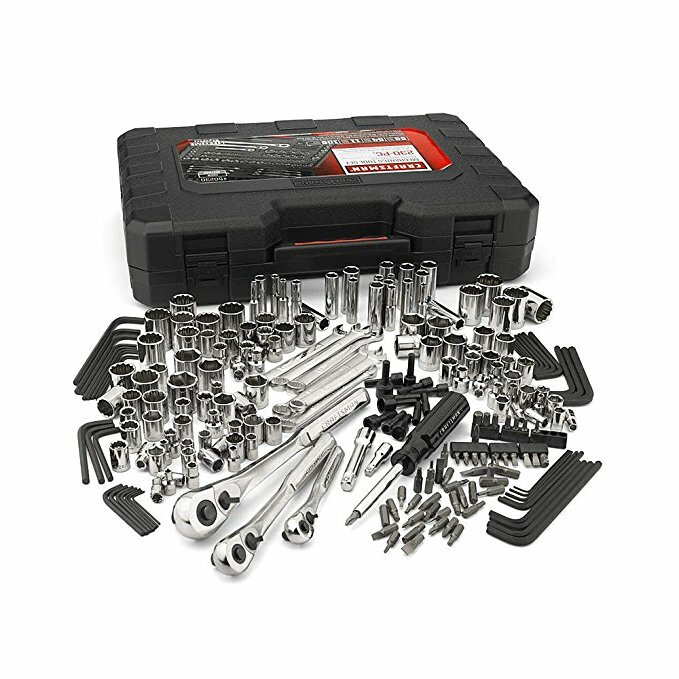 To these add 3 quick-release ratchets, 6-combination wrenches in standard and metric measurements, nut drivers, universal joints, extension bars, and screwdriver bits. Obviously, the pieces feature an all-alloy steel construction for durability and exceptional strength. Also, they come with a useful silver finish that gives them an attractive appearance in addition to keeping off rust and corrosion. The quick-release mechanism takes the time and effort away from changing bits, helping you finish the project quickly and efficiently. And because most of the pieces have magnetic tips, retrieving nuts and bolts should be a breeze going forward. All the pieces come neatly arranged in a heavy-duty, long-lasting carrying case with a handle at the top for easy transportation and storage. 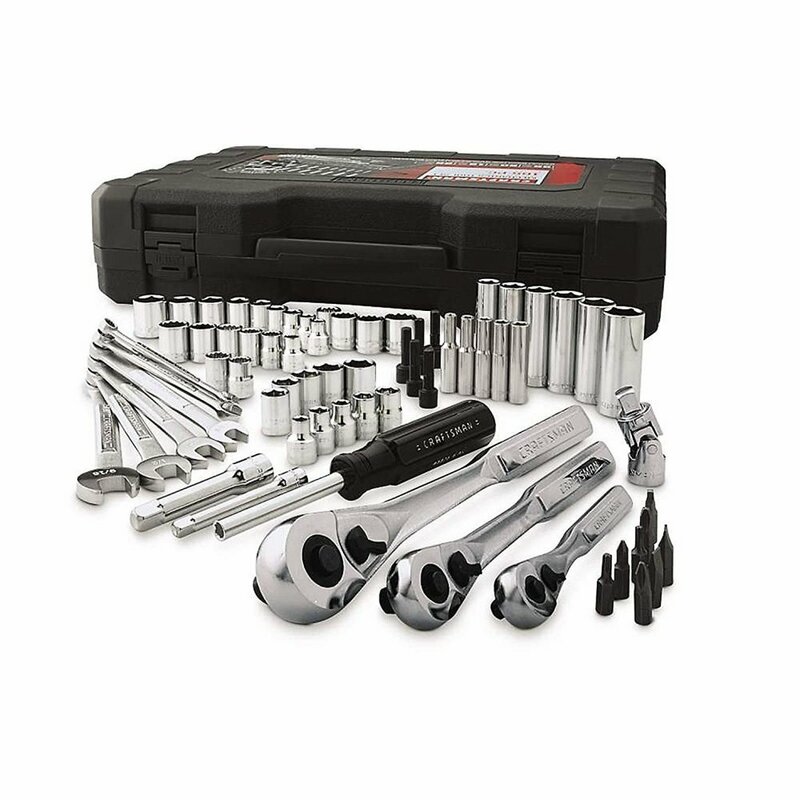 In all, the Craftsman set provides you with all the pieces you need for quick and effective repair or maintenance of various machines around the house. The set is durable, versatile, cost-effective, and make your work incredibly easy. The WorkPro W009044A is a force to reckon with, coming from one of the industry’s highly reputed and customer-trusted WorkPro brand. Both pundits and admirers are wax lyrical about the product’s surprisingly performance and efficiency, arguing it introduces a much-needed paradigm shift in an industry where features are easily replicated across the board. The set is also a perfect choice for both domestic and commercial use seeing as it features high-quality construction and offers incredible ease of use. With a sheer collection of 408 pieces, the mechanics tool set is a versatile set that will dramatically cut the time and effort it takes to complete a project. The tool set boasts a laundry list of convenience and performance features none of which outshines its versatility, however. The heavy-duty and long-lasting carrying case has all the important and most essential tools a mechanic can possibly need to complete a project. You get a socket set, a 16-piece combination wrench set, pliers, a careful assortment of screwdrivers and precision screwdrivers, a hammer, an adjustable wrench, hex key set, utility knife, and a tape measure, among several other pieces. In spite of their sheer number, all the different pieces are made from high-end materials to withstand thorough abuse in the toughest of circumstances and environments without suffering any performance hitches. The fact that they're also chrome plated and fully polished means they are resistant to both rust and corrosion. Relevant pieces also feature an ergonomic design to ensure handling them, even for prolonged periods of time, is a breeze. The likelihood of the hammer bending, even slightly, is also minimal because of its fibreglass handle. And to keep everything within easy and quick reach, all the 408 pieces come neatly arranged in a heavy-duty 3-drawer metal case. If you’re looking for a specific tool, chances are high that the WorkPro W009044A has it. The sprawling set has all the tools you can think of to make quick and short work of the toughest projects. We can’t recommend it enough to the seasoned or budding mechanics out there. Kobalt may not be one of those brands whose names immediately resonates with the target population but their flagship set easily holds a candle to those offered by the more established brands. 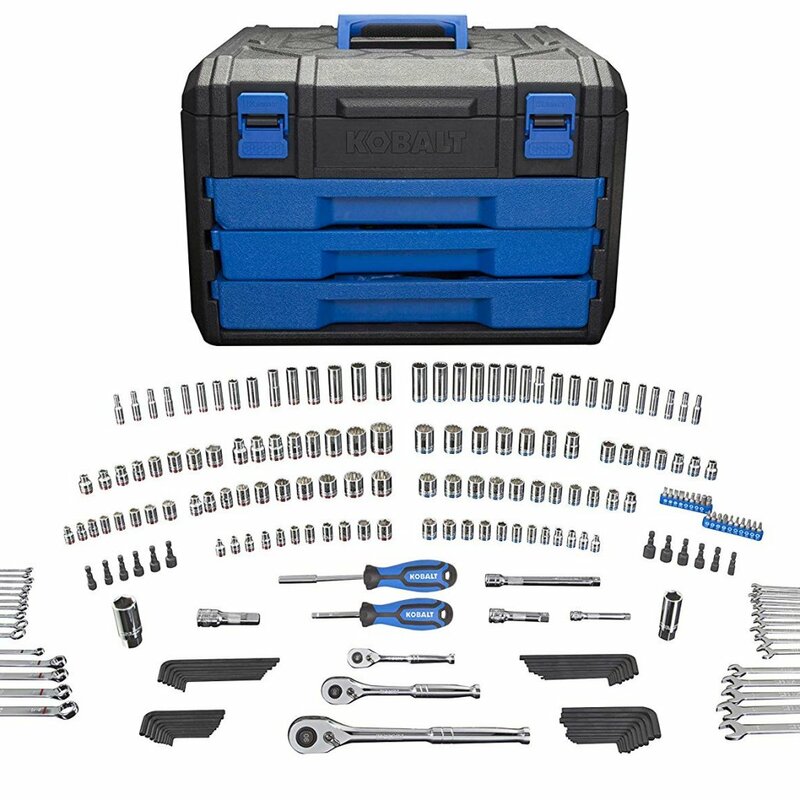 The Kobalt set, as the name suggests, comes with a carefully selected collection of some of the most essential tools you’ll ever need. And the package, in spite of its versatility and the high-quality construction of the individual components, features a pocket-friendly price tag. A detailed review of the mechanics tool set follows in the subsequent paragraphs. Whether you intend to undertake a project around the house, in the garage, or on a construction or work site, the set conveniently packs the vast majority of pieces you’ll need. There are 117 essential 6-point and 12-point sockets in the storage box. To these add 3 ratchets, 4 extensions, 30 combination wrenches, 40 hex keys, and lastly 33 other assorted tools. Bring all these together and you have all the pieces you need to easily and quickly diagnose and effortlessly repair any automotive problem you may be having. As is the case with the vast majority of options, the model is constructed from commercial-grade chrome vanadium steel, meaning that they're not only durable and strong but also rugged enough to handle the toughest jobs. They also feature a high polish finish for keeping corrosion and rust at bay. The relevant pieces boast large and clear laser-etched size markings and a color coded stripe for easy identification of the different pieces. Changing any of the socket or accessories is both quick and effortless, thanks to the quick-release button on the ratchet. And because of the ingenious 72-design of the pieces, swinging a 5-degree arc won't require as much time or effort, as is often the case with cheap, off-brand models. And after completing your project, you get to neatly arrange all the pieces in the heavy-duty 3-drawer blow molded case. The inclusion of a folding top carry handle and two other side carry handles means transportation is never a hassle. Loosening and tightening nuts and bolts has never been easier or quicker. With this set at your disposal, you’ll be finishing your tasks without breaking a sweat or injuring your hands. Soon enough, it’ll be your go-to mechanic tool set. As virtually all seasoned mechanics would concur, it’s expensive investing in a set that lacks torque, strength, and durability. And to be safe, it’s prudent that the set meets or exceeds all ANSI specifications. 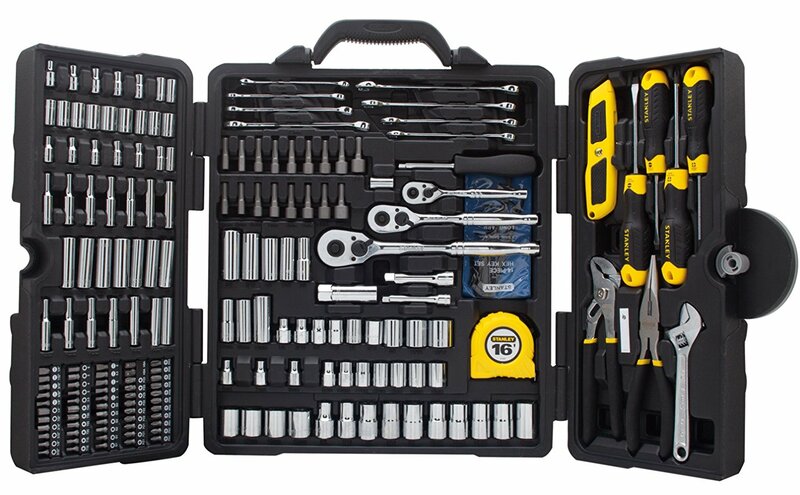 Luckily, you don’t have to comb through the vastness of the Internet in search of such a product as we present you with the user-friendly, easy-to-use, and high-performance Stanley STMT73795 Mixed Tool Set that in addition to meeting all of those criteria, is also versatile and cost-effective. The set includes 210 pieces, a variety that offers incredible flexibility for tackling several projects both around the house and on the commercial work site. Such versatility is further enhanced by the fact that the pieces feature both imperial and metric measurements, making them ideal for all types of screws, nuts, and bolts. 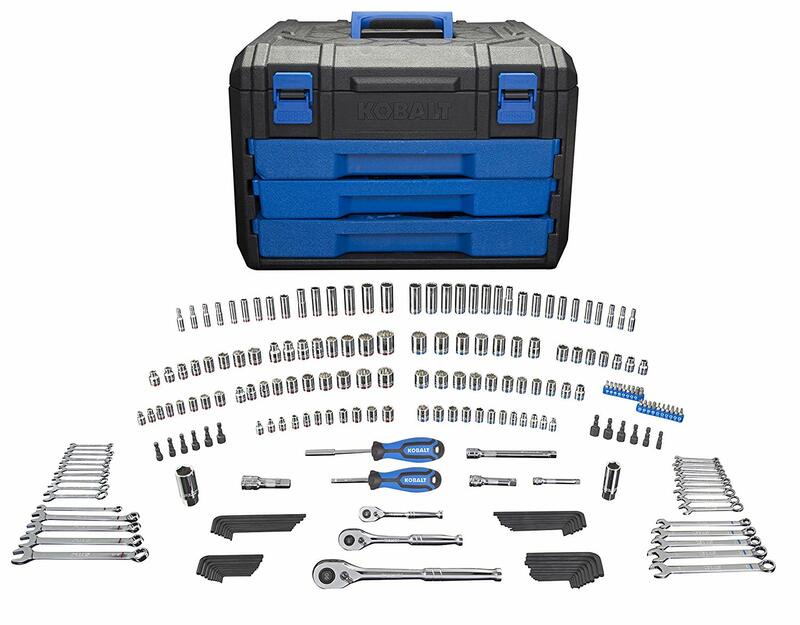 Aside from the standard socket wrenches and universal screwdriver sets, the set also comes with a beneficial 6-inch adjustable wrench, two pliers, a 16-foot tape measure, as well as a utility knife. The careful and comprehensive assortment of various tools means tackling the most fundamental projects should be a breeze. Another factor that makes it an immensely popular choice among professionals and novices alike is the durable, rugged, and high-quality construction of the pieces. The use of chrome vanadium steel, one of the strongest materials around, means the set has an abundance of torque, strength, and durability for effortlessly tackling the toughest projects you'll ever come across. The resilience and reliability the set offers also means it's an economical choice that will provide you with several years of smooth and pain-free service. To the above qualities add a rust and corrosion resistant polish. And for keeping all the 210 pieces organized and safe, you get a useful double-hinged carrying case that’s similarly rugged to survive different work situations. To conclude, the Stanley STMT73795 offers the user incredible value for their money. It packs all the right features and would be a wise selection for the user searching for nothing short of the best at a pocket-friendly price. The Dewalt DWMT81534 is undoubtedly one of the great beneficiaries of developmental increments in the mechanic tool set industry, featuring a litany of nifty features and specs aimed at taking the time and effort from tightening and loosening various nuts, bolts, and screws. Like the first DeWalt set we reviewed earlier, this model has a lot going for it. It gives you quick and easy access to tight spots, features durable and reliable construction, boasts an ingenious design, and packs a variety of tools that are both comfortable and easy-to-use. To find out how it stacks up against other models on this list, continue reading. The set is an ideal choice for the busy homeowner who frequently handles a broad range of repair works around the house and is therefore in need of a versatile collection of various pieces. The set contains within it a raft of sockets, wrenches, accessories and several other specialty bits. The 205 pieces mean you’ll always have the tool you need to complete a project however complex or time-consuming it is. Its dependability and maneuvrability are further reinforced by the fact that the ratchet features a 72-tooth design allowing for a 5-degree arc swing. That, coupled with their incorporation of DeWalt DirectTorque Technology provides for the safest and most secure contract with nuts, screws, and bolts. The result is increased torque that takes the time and effort away from tightening and loosening any fastener. As for ease of use, rest assured that the likelihood of suffering blisters or hand exhaustion from using the kit for several hours is minimal, thanks to their ergonomic and lightweight design. They also feature an anti-slip design for additional comfort all through the course of the project. And to top it all off, you get a long-lasting blow mold case for keeping all the 205 pieces secure. The Dewalt DWMT81534 comes highly recommended for the homeowners who want nothing short of an excellent work experience. The set has a wide variety of tools that are comfortable to use, durable, cost-effective, and highly valuable. Virtually all DeWalt products, whether they are hand tools or not, are synonymous with high-quality production, remarkable ease of use, durability, and efficiency. Like the first two product we've already reviewed, the Dewalt DWMT75049 set, one of its leading products, continues that tradition in a graceful and effortless fashion. The mechanic tool set has a slew of features that will immediately appeal to you the first time you try out the pieces. And for the enthusiastic, value-conscious DIYers looking for a versatile mechanics tool set to use on various projects around the house, we can't recommend it enough. In the next paragraphs, we'll tell you why. 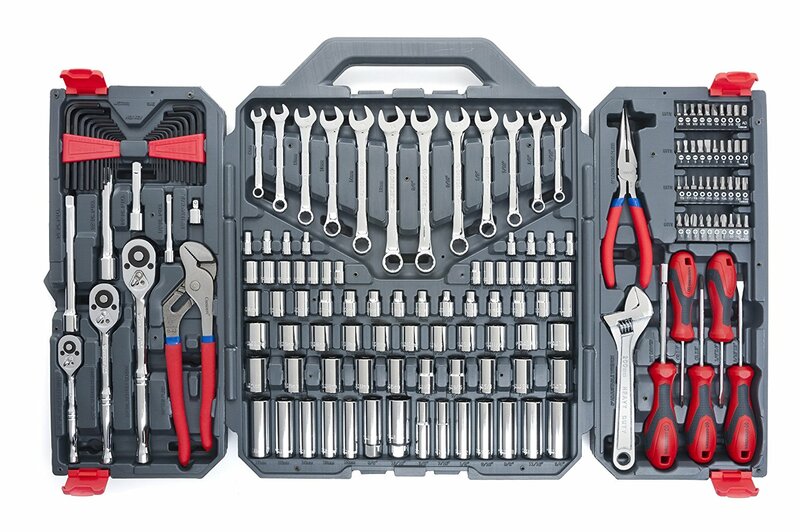 First off, the mechanics tool set comes with 192 pieces, all carefully and diligently assorted to meet all your automotive diagnosis and repair needs and more. You an assortment of metric hex keys, standard hex keys, various sockets, extensions, adapters, universal joints, plug sockets, and a 72-tooth gear system, among several others. The versatility and flexibility the mechanics tool set offer also means you can use it to work in the garage and on the busiest industrial or construction work settings without the slightest glitch. The above-mentioned versatility pairs nicely with the machine's first-rate construction quality. The brand, as you would expect, pulls no punches in ensuring the user has the best work experience with fasteners. To that end, all pieces feature heavy-duty construction using commercial-grade chrome vanadium steel so it can easily withstand the test of time and hardy use. On top of the above features, the set also packs several time- and effort-saving features. The pieces come with knurled rings on the handles to augment traction and comfort while minimizing slippage. The laser-etched markings make for quick and easy size identification while the 5-degree arc swing and slim head design enable the user to easily and quickly access tight and hard-to-reach spots. The 72-tooth gear system mentioned earlier is effort-saving as it ensures high torque ratcheting and since the directional lever features a lightweight and compact design, it allows for effortless one-hand use. For users in search of an accurate and convenient mechanics tool set, take another look at this option. It has everything you need and more. Its resilience means you’ll never be disappointed. The Crescent CTK170CMP2 set may not have as many pieces of tools as other mechanics tool sets featuring on this list, but it does offer the most bang for the buck. Any value-conscious user with an eye for value will grab themselves one of these in a heartbeat. It’s truly versatile, offering all the different pieces that would make for a smooth, trouble-free operation. Some of these include metric and SAE and Allen wrenches, Torx bit sockets, pliers, sockets and several more. And to make it easy to store and transport, all the pieces come neatly and attractively arranged in a sturdy and long-lasting blow mold case. With 170 pieces safely and securely in the new and robust blow mold case, you have everything you need to embark on and successfully finish any automotive project of your choice, whether it’s around the house, in the garage, or on a commercial setting. You get 1/4 inch, 3/8 inch, and 1/2 inch drive tools in both SAE and metric sizes. Additionally, there are drive Type-6, Drive Tang sizes 1/4, 3/8, and 1/2-inches which, together with other tools therein, make the set an all-around mechanics tool sets idea for the vast majority of industrial, mechanical, and commercial applications. The likelihood of suffering blistering all over your hands or hand fatigue or strain are remote at best, thanks to the ergonomic design of the materials, especially the screwdrivers. They offer sufficient traction to minimize slippage as well. And since they are heat treated and feature an all-chrome vanadium construction quality, they can effortlessly stand up to hardy use and resist corrosion and rust. Difficulties accessing hard-to-reach places are a thing of the past as the wrenches feature narrower heads than those of other models. For mechanics and enthusiastic DIYers with eyes firmly trained on acquiring a high-value, versatile, high-performance, yet cost-effect mechanics tool set, take another look at the Crescent CTK170CMP2 set. It provides the user with the best of all words seeing as it meets and even exceeds ANSI and ASME standards. One of the most critical aspects to consider when shopping for a mechanics tool set is the tool options it comes with depending, of course, on the type of project you intend to embark on. To be an all-around mechanic or homeowner, you need a set offering variety or a wide range of pieces. The more varied the pieces, the more versatile the set. To this end, set your heart on acquiring a set with screwdrivers with bits, ratchet extenders, extension bars, pliers, pry tools, and several others. Despite the temptation, resist the idea of acquiring a cheap, low-quality mechanics tool set as the trend will prove to be expensive in the long run, especially if you’re dealing with tough and rugged fasteners. One way of accurately gauging the quality of the set is by checking the material from which they are made. For more than a lifetime of every day, heavy-duty use, you need a set forged from equally high-quality materials such as chrome vanadium steel, alloy steel, high carbon, stainless steel, and several more. Pieces featuring a rust- or corrosion-resistant coating and heat-treated face remote possibilities of corroding or chipping over time. Aside from high-quality construction and versatility, your preferred mechanics’ tool set also needs to be easy to use. First off, check to ascertain the grip is not only firm and secure, but also comfortable. You can confidently choose between handles with a rubber or plastic coating or better yet knurled or diamond designs. The handle should also be slip-resistant. Secondly, lightweight and compact pieces are not only easy to handle for extended periods but also allow for greater maneuverability into tight and awkward spaces. Another equally significant feature is the quick-release mechanism that provides for easy and quick bit changes. A handy, heavy-duty carrying case has a litany of benefits. It helps keep all the different pieces neatly arranged and organized, making it easy to identify the missing pieces. It also provides for stress-free portability, storage, and transportation by featuring a snap-in-place design for securing all the tools, preventing them from rolling and mixing up with the others. Q: What is the importance of a set case? A: Among other things, a tool set case serves the obvious function of keeping all the different pieces neatly organized in a single place. The likelihood of misplacing or losing a piece is thus minimal. Also, it makes for easy and hassle-free portability and transportation from one job site to another. Q: How do I ensure my pieces last for a long time? A: Maintaining a mechanics tool set is less cumbersome than you may imagine. All you have to do is ensure the pieces are safely stored, safe from rust and corrosion, and are thoroughly cleaned at the end of each and every project. Cleaning the carrying case also helps extend their lifespan. It’s difficult overstating the significance of owning a practical and functional mechanics tool set with a varied collection of both SAE and metric pieces. The set is both versatile and reliable and will be indispensable for repairing or maintaining not only your car but several other things around the house and in the garage. Our list features some of the very best the market has to offer. They are well-rounded, cost-effective for the most part and a cinch to use. Choose prudently.